When sailing ships plied the route from Boston to Maine (geographically east of Boston), the wind was usually at their backs, which meant they were essentially sailing downwind. Thus the term “Down East” came into being. In Maine, it refers to the upper coastal region, from Penobscot Bay through Castine, Deer Isle, Mt. Desert Island, Acadia National Park, Bar Harbor, Schoodic Point and up to Lubec. The cuisine here is quintessential New England, especially in a few establishments clustered around Mt. Desert Island. Lobster and chowder houses here are ubiquitous. Cape Cod writer Joseph C. Lincoln (1870-1944), succinctly described the phenomenon of New England clam chowder — “as patriotic as the national Anthem… Yankee Doodle in a kettle.” He might well have had Kathy’s Breakfast and Chowder House in mind, a simple establishment on Rte. 3, Bar Harbor Road, Trenton, ME. The first thing that struck me upon driving up to the modest white building was the patriotic décor. A string of American flag lights arch above the entrance, complemented below by fresh white window planters brimming with red geraniums and dazzling blue Lobelia. Not surprising. 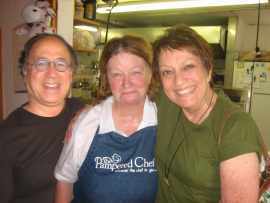 Kathy Hamor, owner/chef, opened her restaurant on July 4th, 2001. Inside, the theme continues, window valences repeating tiny flag motifs and patriotic phrases such as “God Bless America” and “Land of the Free.” She began serving twenty; since, she’s added a screened patio to double its size. She must be doing something right; the chairs don’t have time to cool down, especially for breakfast. 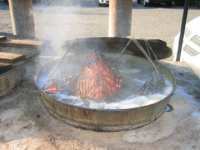 “We are small, but our dream is big: to do our best to serve people fresh home cooking,” states Kathy on her web site. And she honours that promise. Like Kathy, the cuisine is direct and authentic Down East. She runs the tiny kitchen, aided by her husband Li’l Daddy, whipping every order up from scratch. Her breakfasts are incredible: hash, eggs benedict, grits, exquisite bacon, sausage gravy and biscuits and an assortment of breads or toast, rye, white, and whole wheat “bulkies” (round light rolls), all as fresh and moist. The word "chowder" is derived from the French word "chaudière,” meaning "kettle." True to tradition, Kathy’s chowder, created in a huge black kettle, is smooth and milky white, with chunks of pared diced potatoes floating in the broth, adjacent to either tender clams or pieces of haddock. Mild sautéed onions can also be discerned as well. Kathy will not disclose her ingredients; years ago, she made that mistake only to find a rival chowder house immediately altering their recipe to conform to hers. Nevertheless, Kathy’s chowder house prevails and customers continue to return. In addition to the seafood and clam chowder, the establishment boasts lobster (advertised out front as “Lobstah”) served fourteen different ways: hot boiled lobster dinner, lazy man's (sauteed) lobster, lobster Alfredo, lobster stew, lobster roll, lobster club, lobster wrap, lobster salad plate, lobster chowder, lobster omelette, lobster hash with poached egg, lobster eggs benedict, lobster & scallop quiche and lobster Newburg. The lobster omelette, lobster hash with poached egg, and lobster eggs benedict, are available for breakfast, served from 6:00 am to 2:00 pm. The lobster omelette is subtle and delicate, nice chunks of the white meat folded into perfectly cooked eggs, with a mild white sauce oozing out the ends, also available with fresh crab. Dinner on Friday, Saturday and Sunday evenings provides still more regional dishes — the traditional corn and lobster dinner, (“cawn and lobstah dinnah,” as articulated by Kathy), a gently steamed haddock accompanied by a light egg sauce, corned hake — a delicate white-fleshed fish simmered in a brine solution much as one would prepare corned beef, then served alongside fluffy mashed turnips, boiled potatoes, diced pork rinds and chopped raw white onions. Although monochromatic in appearance, the dish is quite tasty. Her rhubarb, blueberry and raspberry pies are exceptional, hot out of the oven, as are her breakfast blueberry muffins, often shipped to California. Herman Melville, the great American novelist, wrote of the Try Pots, a chowder house in Nantucket, Mass. 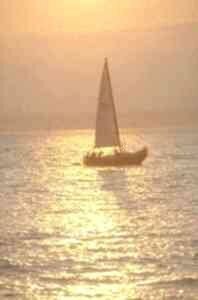 : “Fishiest of all fishy places was the Try Pots … for the pots there were always boiling chowders. Chowder for breakfast, and chowder for dinner, and chowder for supper, till you began to look for fish-bones coming through your clothes.” Switch chowder to lobster and you may well be describing The Trenton Bridge Lobster Pound. The lobster pound is synonymous with the Maine coast. There are at least three within one mile of Kathy’s. The Trenton Bridge Lobster Pound, a family business for fifty-two years and four generations is one such place, a waterfront retail and wholesale operation as well as a roadside restaurant and take-out facility. It is located on the right side of Rte. 3, just before the small bridge that provides the only access to Mount Desert Island and Acadia National Park. A sign on the roof announces "LOBSTERS.” Below the sign a row of wood-fired cookers can be seen smoking away, stoked from stacks of birch logs nearby. Park, step out of the car and the smell is overwhelming — smoking wood combined with seaweed and saltwater — an indelible sensory experience, evocative of an N.C. Wyeth or George Bellows painting of coastal Maine. This lobster pound’s evolution is as quintessentially American its cuisine. Since 1956, George and Gertrude Gascon, John and Dorothy Dunbar, and now the Gascon’s daughter Josette and her husband Anthony Pettegrow have nurtured a growing business which includes live lobster mail-order shipments, steamer clams, mussels, lobster meat and crabmeat, on-line sales, a refrigerated salt-water tank room and a tidal holding pound. Inside the simple white and red shack, the energy is palpable. The drill is straightforward, sometimes called “lobster-in-the-rough.” A staff member will ask if you want a lobster, and how large. You’re then given a number, the live lobster is plucked from a tank before your eyes, weighed and placed in a small woven purse-string net bag with a wooden numbered tag attached to it. If the bag were in the New York Folk Art Museum, visitors would marvel at the macramé design, its aesthetic combination of form and function, its simplicity. Cooking time is scratched on a blackboard and the bag is carried outside to one of the steaming pots where the lobster is cooked to perfection in fresh, clean, seawater, replenished from large red barrels. Josette will ask what sides you want (every item, including the sides, is a la carte, down to the lemons and the butter,) you pay for it and wait. Eventually, your number is called (often by a delightful Russian exchange student working there during the summer), you pick up the red plastic tray heaped with steaming succulence, find a wooden table indoors or out (sometimes shared with others), get a handful of paper towels and dig in with metal picking and cracking utensils. All pounds advertise fresh lobster. The very best ones give you the sensation of the entire ocean engulfing all your senses from the very first morsel ingested. Such is the case at Trenton Bridge. I don’t believe I’ve ever had as tasty a lobster as the ones served here, easy to crack, easy to eat, rich in taste and tender in texture. Additional seasonal items are steamed clams (fat, hot, and delicate, a great appetizer while awaiting the arrival of the steaming red monsters), clam chowder, an incredibly rich lobster stew (small pieces of lobster sauteed in butter and gently simmered in a milk base), lobster and crabmeat cocktails, lobster and crabmeat sandwiches, potato salad, corn on the cob and cole slaw. Fried or grilled foods simply don’t exist. Tasty blueberry cake and pie is available for dessert along with assorted ice cream bars. Beverages include sodas, lemonade, coffee, hot and iced tea. Bring your own wine. At 7:30 pm sharp they cease taking food orders (except for pre-cooked takeout such as cold lobsters and sides). I have witnessed irate would-be diners who, having driven for hours, arrived at the register at 7:32 only to find themselves out of luck. But only 2 minutes? A-yep. Down East Lobster Pound and Lunt’s Lobster Pound are similar to the Trenton Bridge Lobster Pound (lobster in the rough), all within 1 minute of one another on Rte 3. Trenton. Beal's Lobster Pier in Southwest Harbor, is one of the oldest pounds in the area. Adjacent to the Coast Guard station, it’s not the most the picturesque side of the harbor, but offers clams, lobster and sandwiches. Thurston's Lobster Pound in Bernard (across the water from Bass Harbor) is charmingly atmospheric, the quintessential New England fishing village setting. Abel's Lobster Pound is situated adjacent to a marina, at the head of spectacular Somes Sound, the only natural fjord in North America; they serve outdoors at large picnic tables under age-old pines, or indoors at the restaurant. Definitely not lobster in the rough, it's pricier than other lobster restaurants in the area. Nevertheless, children can run freely, as you sip an exotic mint/raspberry tea and watch a tangerine sun setting over the water while picking away at a three pound lobster (unless you’ve ordered the lazy lobster, already out of its shell). They also offer Lobster Newberg, other traditional lobster variations and maintain an extensive wine list. Stewman’s Lobster Pounds are billed as “the only authentic oceanfront lobster pounds in Bar Harbor.” They cater to the huge flow of tourists pouring through the town during the summer, and are located on Rt 3 as one heads into Bar Harbor, as well as downtown on Main Street. May thru October, seven days/wk 6-2 am Sun 7-2, Summer: F-S-S 5pm-8:30 pm. 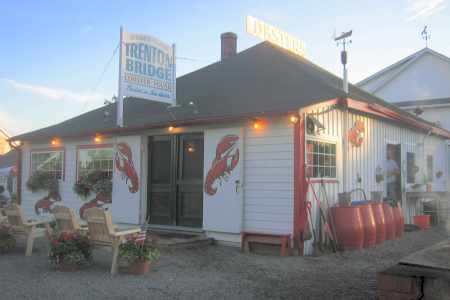 mail orders via a web site www.trentonbridgelobsterpound.com can satisfy your live lobster fix year-round. If you enjoyed reading the above article then you will probably also enjoy Coast-to-Coast (USA), also in North America, and our latest articles covering the Orinoco Delta, La Mata, Marbella and Beijing.